When I mention how much I use these little gems to people, they always give me that "but you're not a baby?" look. 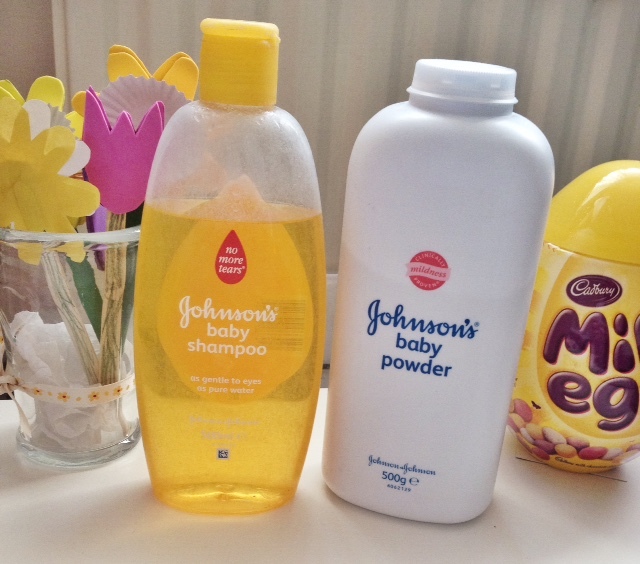 I thought I would do a quick post about the Johnson's Baby Shampoo and Powder because I use them almost every single day. The Johnson's Baby Shampoo is perfect for me because I have very greasy hair, so wash it every day. I use this every other night, alternating this with my usual shampoo and conditioner throughout the week. I find that if I use the same shampoo and conditioner every night throughout the week, my hair starts to feel heavy and clogged up with products. This is very gentle but great for refreshing my hair. I'm not a huge fan of the smell but I think you can now buy alternative fragrances. I also actually use this to clean my make up brushes. After trying numerous brush cleaners, I found that they were very overpriced and didn't get my brushes looking brand spanking new. I now run my brushes under a lukewarm water to remove the excess make up, and then massage in a pea sized amount of this shampoo, before rinsing again. My brushes have never felt softer or cleaner. The Johnson's Baby Powder is my ultimate post-shower product. Once I've showered and dried off, I apply baby powder all over my body. For some reason, whenever I've showered, my skin goes bright red in patches all over me (and it's not because I have the water too hot). I tend to get really itchy as well - it is almost like I'm allergic to the water! Not only does this smell incredible in my opinion, but it is perfect if you have oily or shiny skin. My legs are always really shiny and so this is great to apply to tone that down. At the same time, it doesn't leave my skin feeling dry. This is really gentle and I find that I'm no longer itching away and causing skin irritation. Do you have any products you treasure that are not your usual beauty products? I would love to find some new hidden gems! I use baby powder every night after the shower too and always have done! I really think it's helped keep my skin soft. I haven't used baby shampoo before but my hair gets really greasy so I'd like to see if it will help! I love Baby Shampoo, it have just a dry scalp it is great to use on it.